Louis Octave Uzanne (14 September 1851 – 31 October 1931), known as Octave Uzanne, was a 19th-century French bibliophile, non-fiction writer, publisher and journalist, best-known for his Contes pour les bibliophiles (1895), which features the novella The End of Books. He also wrote "L'idée de sadisme et l'érotologie scientifique" (1901). Born in Auxerre, of a bourgeois family, he came to Paris after his father's death. At first he studied at the upper-class Collège Rollin in Paris, then during the Franco-Prussian War of 1870–1871 was attached to a school at Richmond in England. Continuing with law studies, he abandoned this line of work when he came into an inheritance in 1872. He became a regular visitor of the Bibliothèque de l'Arsenal, where he formed part of a group of followers of the former librarian Charles Nodier, together with journalist Charles Monselet, writer Loredan Larchey, and author and bibliophile Paul Lacroix. He also joined the Société des Amis des Livres, the first French bibliophilic association. At the start of his career, Uzanne focused on the lesser-known writers of the 18th century, with 4 volumes of work published by Jouast, and an additional 20+ volumes published by Albert Quantin. He was an admirer of the Goncourt brothers, who also wrote on 18th-century France. While looking backwards for his subjects, he was very up-to-date for the technical side of the printing and publishing. His 1879 work Le bric-à-brac de l'amour was one of the first to employ the gillotage, a Zincography technique, and photomechanical reproduction. After leaving the Société des Amis des Livres, which he deemed as too conservative and too concerned with the re-edition of older works, he started two new bibliographic societies, the Societé des Bibliophiles Contemporaines (1889–1894) and the Societé des Bibliophiles Indépendants (1896–1901). The first one consisted of 160 people, including writers Jules Claretie and Jean Richepin, artists Albert Robida and Paul Avril, and journalist and critic Francisque Sarcey. Uzanne also edited two magazines, Conseiller du bibliophile (1876–1877) and Les Miscellanées Bibliographiques (1878–1880), and then ran three consecutive bibliophilic revues: Le Livre: Bibliographie Moderne (1880–1889), Le Livre Moderne: Revue du Monde Littéraire et des Bibliophiles Contemporaines (1890–1891), and L'Art et l'Idée: Revue Contemporaine du Dilettantisme Littéraire et de la Curiosité (1892–1893). In contrast to the common bibliophiles of his time, he was most interested in the creation of new, luxurious bibliophile works, collaborating closely with printers, binders, typographers and artists (especially the Symbolists and early Art Nouveau artists). One of the main artists collaborating with Uzanne was the Belgian Félicien Rops, who illustrated some of his books and created the cover illustration for Le Livre Moderne, and who called Octave Uzanne "the Bibliophile's dream". 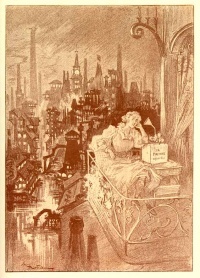 The overall quality of Uzanne's books was remarked upon by the New York Times when reviewing his 1894 work La Femme à Paris: "The book is a highly-artistic achievement in a typographical sense[...] This artistic element and the style of the author [...] elevate the work from its sphere of usefulness into the sphere of pure literature. It will be serviceable a century from now to students of our civilization." His collection of contemporary bibliophilic books was sold in 1894 by Hôtel Drouot. It contained some of the finest examples of late 19th-century French bookbinding, by binders like Charles Meunier, Lucien Magnin, Pétrus Ruban, Camille Martin, René Wiener and Victor Prouvé. As a journalist, sometimes employing the pseudonym "la Cagoule", Uzanne wrote for L'Écho de Paris and other newspapers, including a collaboration with Edouard Drumont on his antisemitic newspaper La Libre Parole, and for other French and foreign magazines like The Studio and Scribner's Magazine, for which he wrote in 1894 an article about The End of Books which he thought would come because of the upcoming phonography, predicting the rise of radio and television. Uzanne was fascinated by modern technology and the possibilities it offered for the reproduction and dissemination of words, sounds, and images, which wasn't only evidenced in that article or in his groundbreaking work in book publishing, but also in an article he wrote in 1893 for the French newspaper Le Figaro, about a visit he made to Thomas Edison, where he witnessed the Kinetograph shortly before it went public. Another interest of Uzanne was female fashion, about which he wrote a number of books and articles, which were also translated in English, and more specifically the image of the Parisienne, the women of Paris. His 1898 work Monument esthématique du XIXe siècle: Les Modes de Paris, translated as Fashions in Paris, was according to the review in the New York Times "[...]the most complete and exhaustive work on the subject of French fashions that has yet appeared". He died at Saint-Cloud on 31 October 1931. 1896: Contes de la Vingtième Année. Anthology of Bric à Brac de l'Amour, Calendrier de Vénus, and Surprises du Cæur, published by Floury. 1904: The French bookbinders of the eighteenth century, Chicago, Caxton Club, translated by Mabel McIlvaine. 1910: Etudes de sociologie féminine: Parisiennes de ce temps et leurs divers milieux, états et conditions, published by Mercure de France; published in English in 1912 as The Modern Parisienne by Heinemann, London and by G. P. Putnam's Sons, New York; published in German as Die Pariserin. Studien zur Geschichte der Frau der Gesellschaft der Französischen Galanterie und der Zeitgenössischen Sitten. in 1929 by Paul Aretz, Dresden. Uzanne also contributed notes, forewords or commentary to a number of other books. Unless indicated otherwise, the text in this article is either based on Wikipedia article "Octave Uzanne" or another language Wikipedia page thereof used under the terms of the GNU Free Documentation License; or on original research by Jahsonic and friends. See Art and Popular Culture's copyright notice. This page was last modified 21:17, 26 February 2019.